WARNING: Here's Why You Shouldn't Buy A Fruit If You See This Label On It! Home » Tips » WARNING: Here's Why You Shouldn't Buy A Fruit If You See This Label On It! 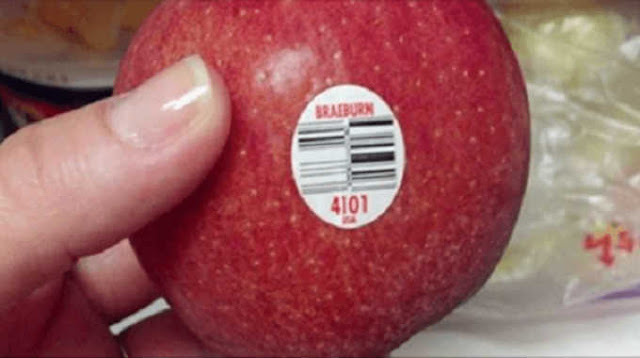 Most people are not aware that the stickers attached to the fruits and vegetables, are there for more than just scanning the price. The PLU code, or the price lookup number on the sticker can help you determine if the product is genetically modified, organic or produced with chemical fertilizers, fungicides or herbicides. 01. A four-digit code beginning with a 3 or a 4 means the produce is probably conventionally grown. The last digits of the code represent the kind of the fruit or vegetable you are buying. For example, bananas are always labeled with the code of 4011. 02. If there are five numbers, and the first is “8″, then the product is genetically modified. The label on genetically modified banana (GE-genetically engineered of GMO) would contain the numbers 84011. 03. A five-digit number that starts with a 9 means the item is organic. Organic bananas are labeled with 94011. EWG (The Environmental Working Group) analyzed pesticide residue testing data from the U.S. Department of Agriculture and Food and Drug Administration to come up with rankings for these popular fresh produce items. The Environmental Protection Agency warns that the consumption of pesticides can lead to health problems such as “birth defects, nerve damage, cancer, and other effects that might occur over a long period of time.” Children are especially at risk of harm from pesticides. These foods have very high pesticide loads and should always be purchased organic or grown yourself! The following foods were found by EWG to be relatively low in pesticide residue. They may be good conventional options for those on a budget.